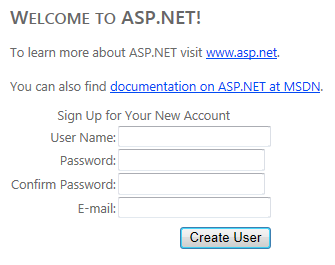 The CreateUserWizard control in ASP.NET makes it super easy for your users to sign up for an account. Simply add it to a page, configure it, and you're good to go. In addition, you can control the way it behaves using settings in the web.config file (such as whether or not duplicate e-mails are OK, password lengths and strength, whether or not you want to implement a "security question and answer" and so on). Also, when you don't like its appearance, you can customize the wizard's steps which expands its underlying HTML into your page, so you get full control over the rendering. However, when you customize the steps, you'll find that the config setting that controls the display of the "security question and answer" no longer works as expected. In this article you see how to set up your control so it still takes the config settings into account. These settings make it easy to influence the behavior of the CreateUserWizard from configuration. However, this model breaks somewhat when you customize the Create User Step. The next section explains why this happens, and how to solve it. 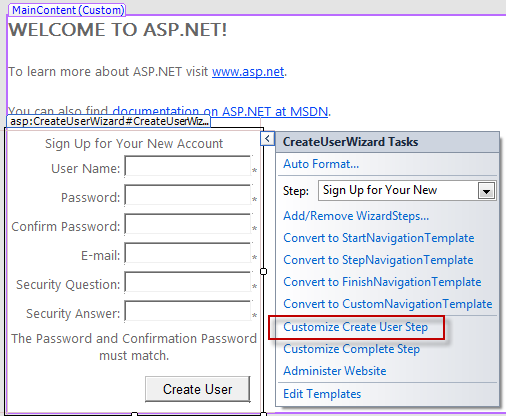 Switch the page with the CreateUserWizard into Design View. This adds a lot of HTML to the page which you can now fully tweak to your likings. This is the piece of code that renders the row with the security question. If you now run the page with this control in the browser, with requiresQuestionAndAnswer set to false in the web.config file, you still end up with the security question and answer in your page. By customizing the steps, you lose the possibility to link these controls to the setting in web.config. To solve this, you have a few options. The easiest one is to simply delete the code that renders the security question and answer from your HTML. However, while this works, you also lose the ability to control these fields from the config file. What if your requirements change and you do need to add the security question and answer back in a week from now? You'd need to manually add the code to your page. Wrap the relevant code in a server-side PlaceHolder you can use to show or hide its contents. Control the visibility of the PlaceHolder from Code Behind based on the settings in web.config. You'll see how to implement this next. Notice how the question and answer controls are now wrapped in an PlaceHolder control. The control has an ID so you can refer to it from Code Behind. 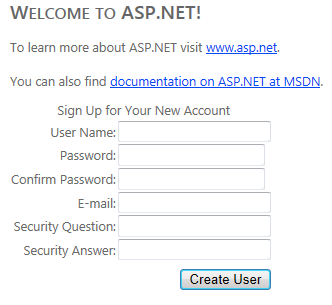 (Note: For the Membership class to be available you need to add a using statement for the System.Web.Security namespace). This code does a few things. First, FindControl("CreateUserStepContainer") is used to get a reference to the user step that is being rendered. You won't find this control in the generated HTML as it's used internally by the control. I had to use Reflector to figure out the name of this container. The code then uses FindControl again; this time to find the PlaceHolder control I added earlier. The final piece of the puzzle is determining the PlaceHolder's visibility. The Membership API exposes its configuration through the Provider property which in turns tells you whether or not a security question and answer is required through its RequiresQuestionAndAnswer property. This property maps directly to the attribute requiresQuestionAndAnswer in the web.config file. With these changes applied, you get the best of both worlds: you can fully customize the presentation of your CreateUserWizard control, while you can still control the behavior for the security question and answer through the web.config file. tnx It helped me a lot. i want to create user wizerd without the email ...and i want to add the new user into my database ...HOW I CAN DO THAT?